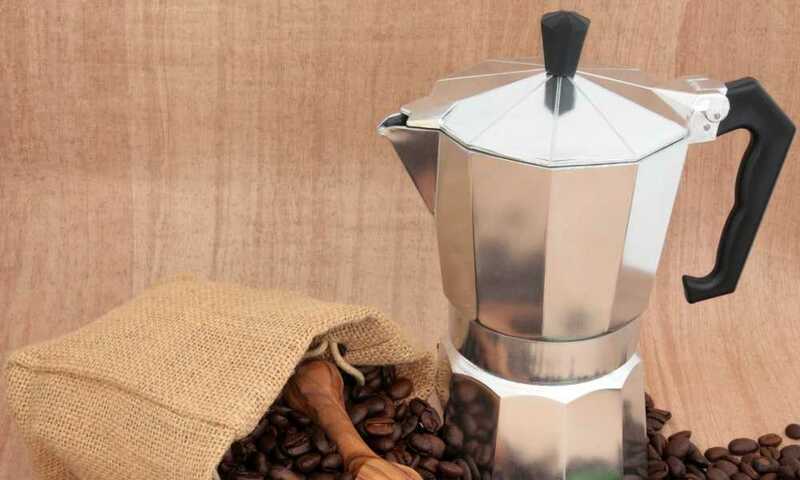 While there’s certainly no shortage of coffee aficionados who will argue until they are blue in the face over which method of brewing coffee is best, there’s no disputing the fact that French press coffee makers are one of the most popular choices. They are definitely capable of making one mean cup of coffee. There’s also no shortage of product options available to coffee lovers these days. So with that in mind, we set out to find out what is the best French coffee maker of 2018. Read on to see what our findings were! What Does a French Press Do? What Kind of Coffee to Use With a French Press? How to Use a French Press? We recognize that for many people, making the switch from instant or drip coffee over to using a French press coffee maker can be quite an adjustment. It can be hard to tell if you will end up preferring French press coffee or not. It makes sense in that case to go for a more budget friendly French press -- if you end up loving it, you can always upgrade later on. With that in mind, TOP-MAX makes a great coffee maker at an affordable price, and it’s our top budget option for 2018. 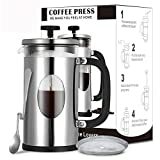 The TOP-MAX French press coffee maker is made out of military-strength 304 grade stainless steel, making it an incredibly durable little product. It’s got a thermal shock resistant borosilicate glass teapot, and it’s also incredibly easy to clean, whether by hand or in the dishwasher. The filter is made with a spring-loaded base plate, a super fine mesh screen, and a stainless steel plunger. EFFECTIVE FLITER SYSTEM: 3- layered stainless steel fliter structuer traps the smallest coffee grounds to produce an exceptional full-bodied flavor. Filter screen is easy to disassemble and clean. Perfect to make fresh french coffee, tea, espresso or even cold brew. ONLY THE FINEST QUALITY MATERIALS: All individual materials surpass food/drink grade quality requirements with certified lab tests to back it up. FDA Approved, BPA free plastic lid strainer, 304 food grade rated stainless steel, thermal resistant borosilicate glass, all this make our french press of exceptional durability that stands up to everyday safe use. COMFORTABLE HANDLE: It is durable & sturdy, clever design for free flowing & effortless pouring to your mug which also features a BPS / BPA FREE lid were no plastic comes in contact with your hot or iced cold brew tea while steeping. 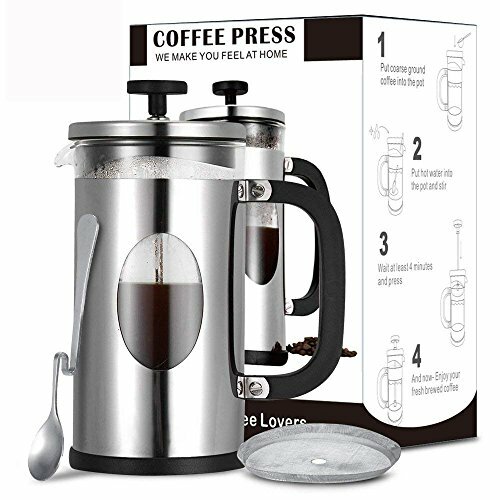 LARGE CAPACITY: Unlike similar products on the market, TOP-MAX French Press has a large capacity, being able to produce no less than 8 cups of coffee or tea. Stop using impractical and time-consuming presses while having house guests, and always be prepared to provide delicious coffee brews! PACKET & WARRANTY: Comes with 1x French Press, 1x Extra Replacement Screen, 1x Coffee Spoon, 1x Using Manual. -Guaranteed for life against breakage and damage, 1 Year Warranty. What impressed us the most with the TOP-MAX was just how high quality a product it is for such a great budget price. Usually, more budget oriented products end up sacrificing in certain areas, but that’s not the case at all here. As far as entry level French press coffee makers go, you really can’t do much better than the TOP-MAX. They even package in an extra mesh screen replacement and a coffee spoon. All in all, you get a lot of value for a great price. The only glaring issue that we could find with this product is that despite the fact that it’s completely dishwasher safe, we found it much more efficient to clean it by hand. The reason being that while TOP-MAX recommends not to remove the glass carafe from the holder when washing, this ends up causing water to become trapped between the glass and the holder. You are better off to remove the glass carafe and wash them separately to avoid this. When you’re out camping and enjoying the scenic beauty of nature, nine out of ten times you won’t have the luxury of being able to use any sort of electrically operated coffee makers. It’s precisely times like that when a French press ends up being a great investment. While pretty much every press is easily portable, some options are better suited to camping than others. With that in mind, Coffee Gator makes our pick for the best French press for camping in 2018. Just as with the TOP-MAX French press, Coffee Gator’s coffee maker is also made with 304 grade stainless steel, making it an incredibly durable, high-quality product. It also features a double-layered vacuum wall, helping to keep your coffee hot for longer. Coffee Gator also uses a two-step, double filtration system that is backed up by a sprung guard holding everything in place, ensuring that every cup of coffee has less sediment than other French press makers can manage. There’s also a couple of great bonus products included, which we’ll discuss next. Not only are you getting a fantastic, high-quality French press coffee maker with your purchase, but Coffee Gator also throws in two great bonus items as well: a mini canister capable of holding two cups and a “10 Hacks to Make Better Coffee” ebook. The ebook may contain redundant information for many coffee lovers, but for anyone new to using a French press, it may be useful. The canister is absolutely perfect for when you’re out camping as well, as you can fill it up and be good to go for any hikes or other outdoor activities. As this product comes in multiple color options, we settled on reviewing the orange model. While the product itself works as advertised, we noticed that the paint used on the coffee maker wears off quite easily. This won’t be a huge concern for anyone who is just interested in making coffee, but it was definitely an annoyance for us. There’s nothing worse than when your pot of coffee goes cold before you’ve finished enjoying it. And microwaved coffee definitely just isn’t the same. That’s exactly why many French press coffee makers are designed with thermal insulation that lets them keep your coffee hot for longer. Out of all the thermal products we reviewed, the absolute best thermal French press available in 2018 is the Bodum COLUMBIA. The COLUMBIA is made out of high quality, insulated double-wall stainless steel that keeps your coffee nice and hot for up to two hours. That quality design extends to the three part stainless steel plunger and mesh filter as well, which help to extract all of the great aromatic oils and subtle flavors of your blend into your cup instead of being absorbed into a paper filter. 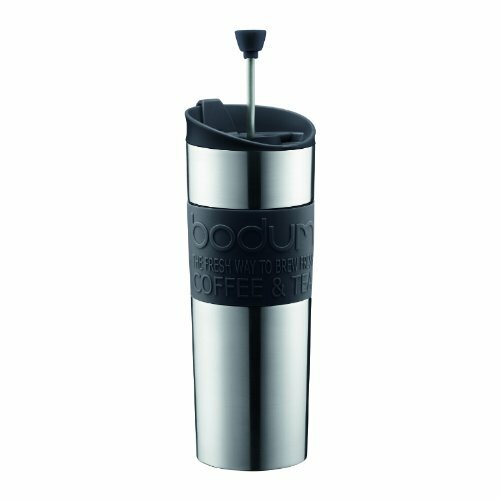 All of the French press products made by Bodum also feature a patented safety lid that helps to prevent spills. Out of all of the French press coffee makers that made it onto this list, the COLUMBIA is the only product that’s capable of making 12 four ounce cups of coffee. While for some people, this feature is totally irrelevant, we really appreciated being able to brew more coffee in one go, especially since the thermal design kept that same brew hot for a couple of hours. 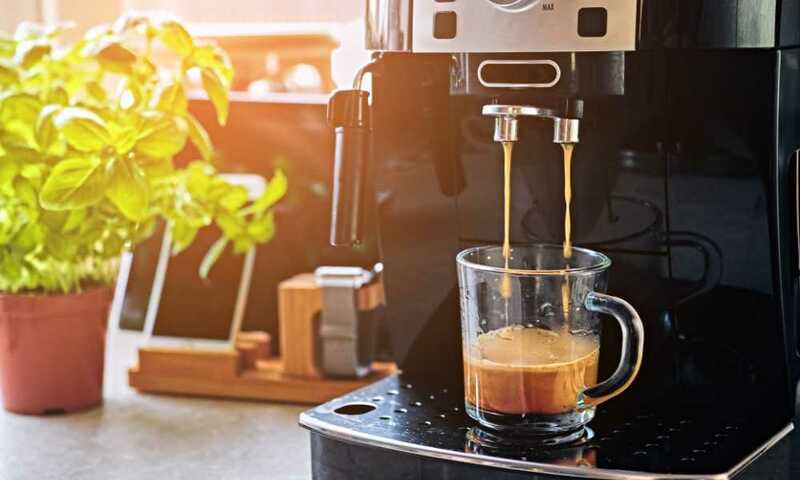 The only thing that kept this coffee maker from getting a perfect score from us is the fact that although the plunger and filter are made with high quality stainless steel, the filter does end letting a noticeable amount of coffee grinds through. However, it should be noted that other users have reported that the filter works great -- this issue could simply be a manufacturing flaw in the coffee maker we used to review. 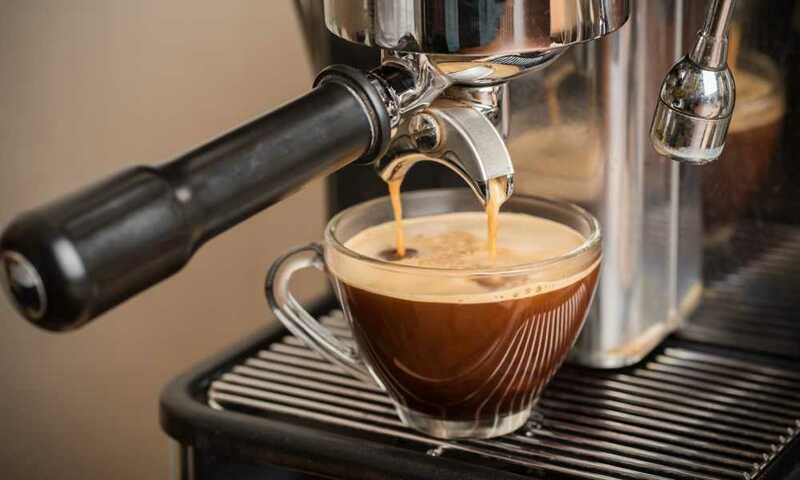 While we personally prefer French press coffee makers that feature a stainless steel design, there’s a lot of coffee lovers out there who prefer a completely glass design. Both options are ideal for making a delicious cup of coffee, and which option is best is largely a matter of personal preference. With that in mind, Idylc Homes definitely make the best glass French press coffee maker available in 2018. 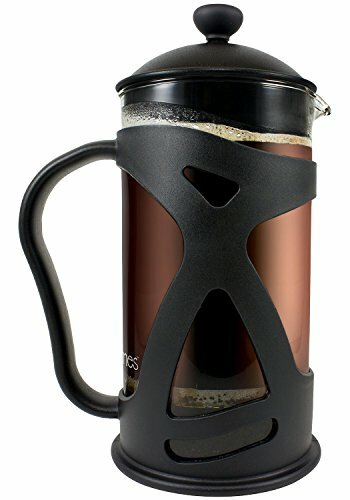 The KONA features a unique, innovative design with a stylish insulated outer shell that protects against chips and cracks and the coffee pitcher itself is made out of extra thick borosilicate glass. The lid is also is BPS and BPA free, ensuring that no plastic comes into contact with your coffee at any time. The stainless steel filter screen is quick and easy to detach and the coffee maker is completely dishwasher safe, making it incredibly easy to clean. While we’ve crowned the KONA as the top glass French press of 2018, it also excels in a couple of other categories that we’ve covered. It’s insulated outer shell means it functions great as a thermal coffee maker as well, and it’s stylish, portable design makes it a great choice to take on coffee trips as well. Better yet, it’s also an incredibly affordable option when compared to some of the products featured on this list. While the KONA certainly offers a lot of bang for your buck, the one thing that we weren’t really a fan of with this coffee maker is the filter. The coffee maker has a rather bare-bones basic filtration system with zero support for the center post, meaning you’ll likely end up replacing the filter a little more often than you might like to. 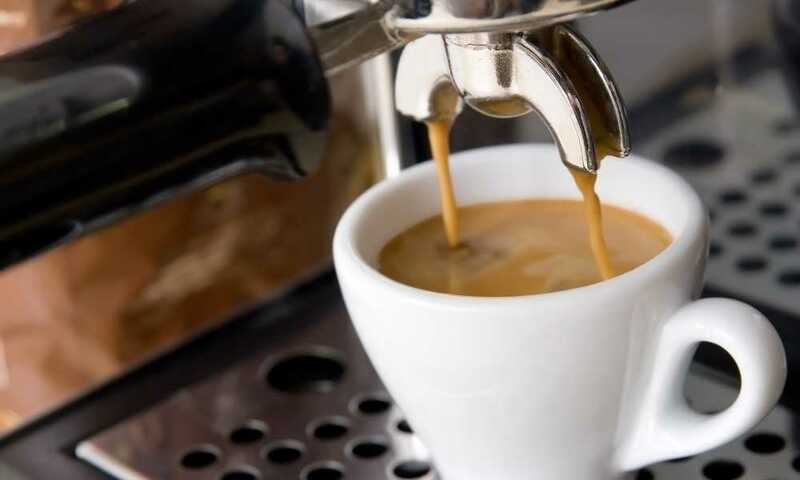 Whenever you’re traveling, you have to pack a few key items: clothing, passport, and of course, a means to make your cup of joe while on vacation in case of emergency. While nearly every French press coffee maker is quite portable, the Bodum travel tea and coffee press excels as it allows you to not only brew your coffee on the go, but also lets you drink it right out of the same container. 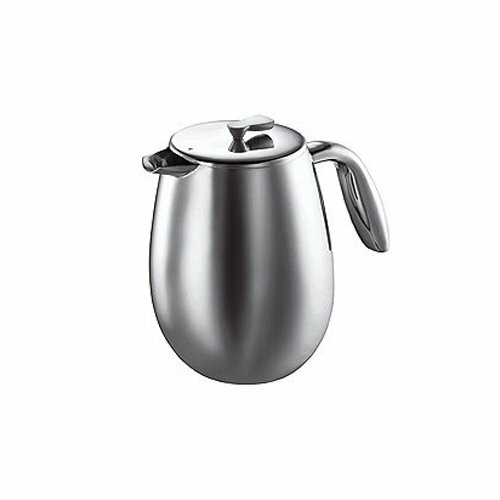 The Bodum travel tea and coffee press is an incredibly quick and easy coffee maker to use. All you have to do is add in some coarse grinds and hot water, seal the lid, and within a few minutes, you can enjoy a deliciously brewed coffee straight out of the container. 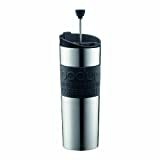 It’s made with a vacuum-sealed, double-wall stainless steel construction that is both incredibly durable and helps to keep your coffee warm for longer. The best thing about this Bodum is the fact that it’s a completely all-in-one product. You can use it to brew your coffee, which is incredibly straightforward to do with this press, and then also just drink your coffee right out of the press as well. No coffee cups required! 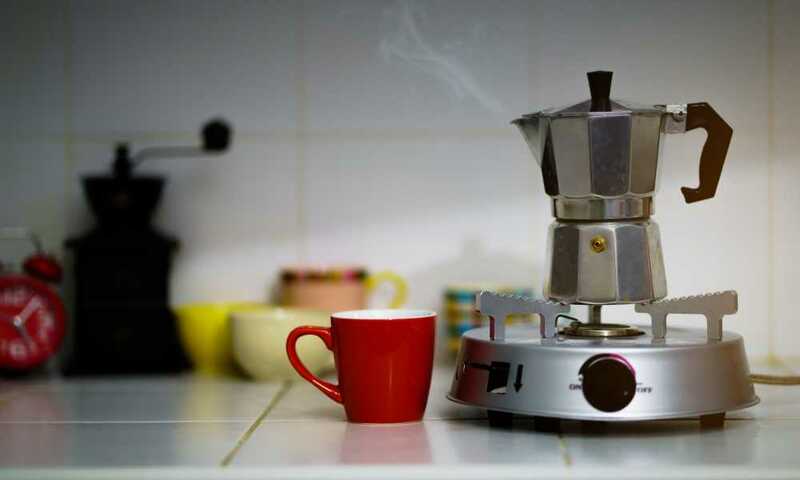 It’s the perfect coffee maker to have with you in a pinch for when you’re traveling and have no other means to get a cup of coffee. Our only concern with this French press is that it doesn’t appear like it would hold up very well with constant, daily use. As we recommend it for traveling, this is likely not an issue for most people, but if you’re looking for a coffee maker to use both at home and on the road, you might end up disappointed with this one. On the other hand, if you only use it sporadically while traveling, you’ll likely be satisfied with your purchase. If you’ve never purchased a French press before, then you should take a few minutes to read through the following section. It will go over the reasons why we chose the comparison categories featured in this review in more detail. This will help to give you a better understanding of what you should be looking for when buying a French press and what you should try to avoid. In general, there are three types of French press coffee makers available -- plastic, glass, and stainless steel. 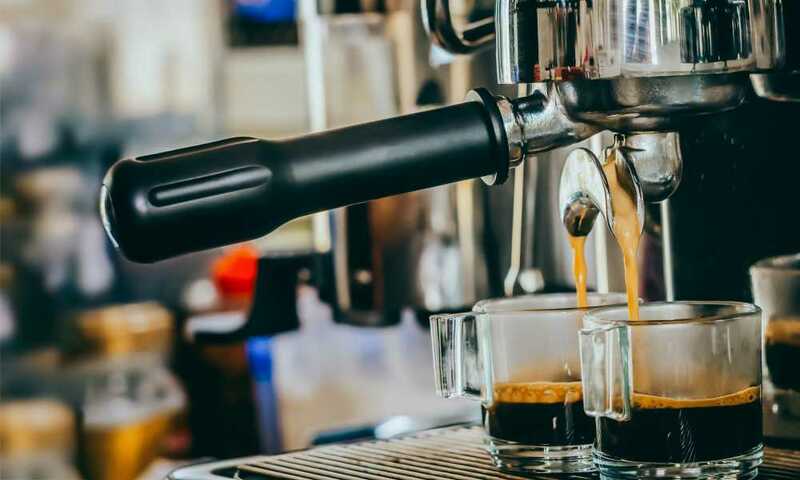 Plastic coffee makers are in general quite durable, and they definitely have one benefit over glass products in that they are usually designed to be quite shatterproof. 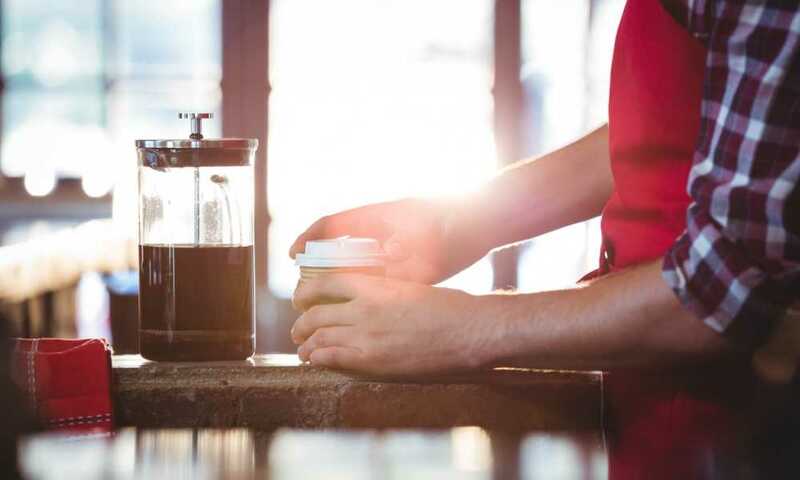 Many plastic products are also BPA free these days, although many coffee lovers still prefer to go with products that minimize the contact their coffee has with plastic. Glass and stainless steel French press coffee makers are by far the more popular options. Many of these products are insulated, which lets you keep your coffee hot for longer periods of time. They also tend to produce a much better tasting cup of coffee, especially when paired with a metal screen filter. How many cups of coffee a French press coffee maker is capable of making will all depend on the specific product. The three most common cup sizes available are 3, 8, and 12. If you are brewing for yourself and you usually only have one or two cups of coffee, then you’re probably alright purchasing a 3 cup French press. 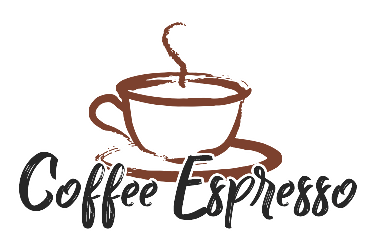 On the other hand, if you drink multiple cups of coffee or you have several family members who will be wanting a cup, you should consider an 8 or 12 cup coffee maker instead. The vast majority of French press coffee makers are built with stainless steel mesh screen filter systems. They have the advantage of being reusable a great many times before they have to be replaced, and they also allow more of the aromatic oils and rich flavors of your grind into your coffee. Paper filters are available for certain types of French presses, although they are somewhat rare. 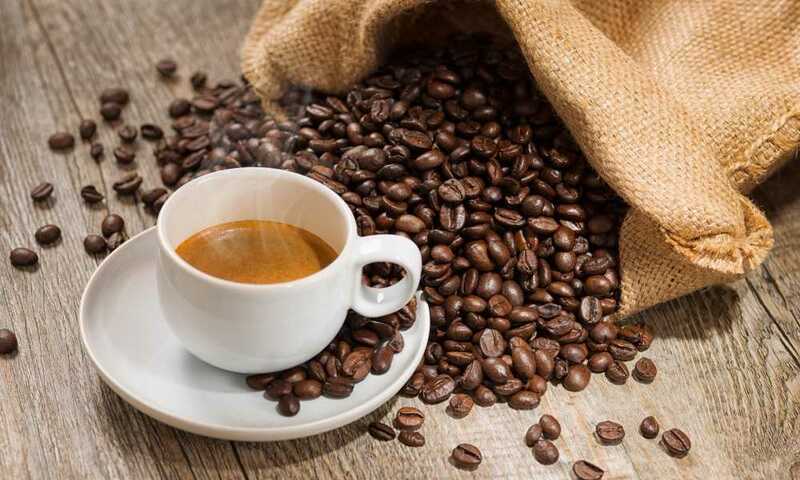 Many users prefer not to use them, since they have to be disposed of with each use and they tend to absorb a lot of the oils and flavors found in your coffee beans. Whether or not your French press can be a very important consideration for many people when buying one. It already takes a fair bit of effort to manually brew your coffee when using a French press, especially when compared with drip or instant coffee. Washing your coffee maker by hand can add even more steps to the whole process. Thankfully, most French press machines are 100% dishwasher safe for quick and easy cleaning. If you are ever in doubt, simply check the product package -- it will usually let you know if the coffee maker is dishwasher safe or not. A French press is a coffee maker designed for manual brewing that was first patented way back in 1929 by Attilio Calimani. It consists of a cylindrical pitcher, usually made out of plastic, glass, or stainless steel. 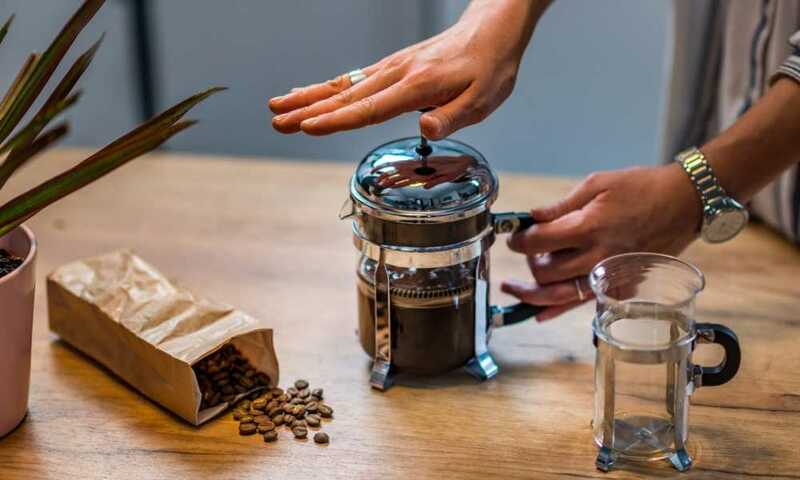 They feature an accompanying lid (usually metal or plastic) that has an attached plunger and filtration system (most common type of filter is a mesh screen) used for filtering grounds out of your coffee as it brews. The short answer: it makes an incredibly delicious cup of coffee! The long answer: a French press uses the pressure exerted when you push the plunger down to force your coffee grounds to the bottom of the pot after brewing, helping to capture more of the oils and flavor for your cup of coffee. 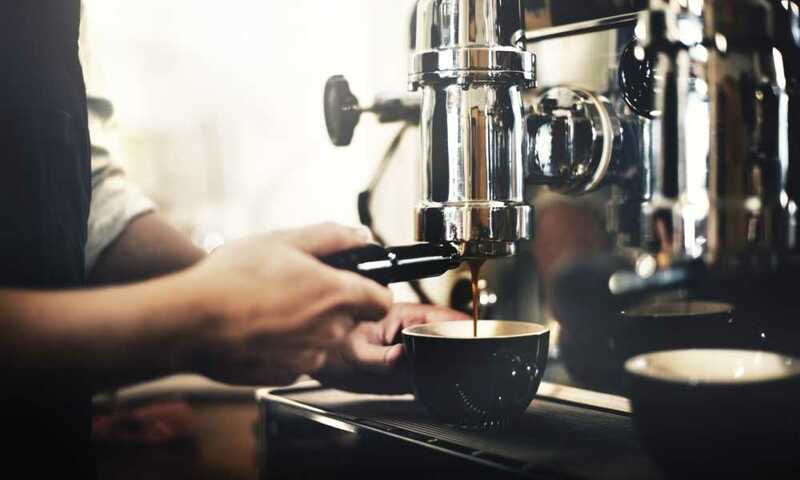 They offer coffee lovers a greater degree of control over how they brew their coffee when compared with other options, like drip coffee machines. You are better off using fresh, whole beans for brewing ANY kind of coffee. Once you grind your coffee beans, they immediately begin to release the volatile compounds contained within. To get the most out of your cup of joe, always use fresh beans. When you grind your beans, you’re going to want to use a coarse grind instead of a fine grind. This will help prevent a ‘muddy’ coffee texture. Cleaning a French press is an easy process. Dispose of any coffee grounds in the bottom of your pot, detach the lid and plunger, and then simply wash all of the components with warm water and soap, and then leave them to dry. The majority of French press coffee makers are safe to place in the dishwasher, so you can place the components in with your other dishes to wash if you’d rather not clean them by hand. So to recap, we’ve listed five of the very best French press coffee makers available to meet a variety of needs. We’ve got a few recommendations for the best thermal, glass, and travel French presses. We’ve got options for anyone who loves to camp and for those on a budget. But which of the five products reviewed do we think is the very best of 2018? It offers an incredible amount of value at a great price that is even suitable for anyone shopping on a budget. 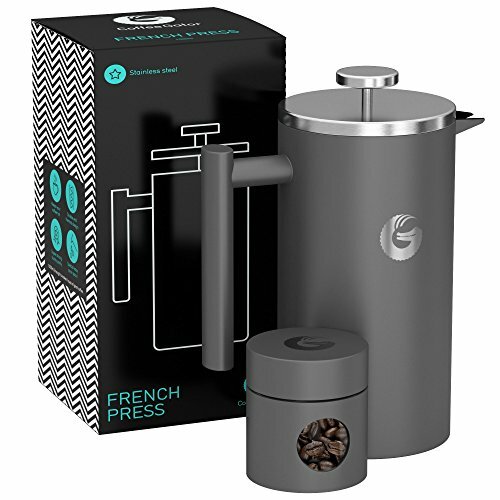 You get a high-quality French press device, and great bonuses included with the mini canister and coffee hacks ebook. It’s made of high quality 304 grade stainless steel that’s also been insulated, making it an ideal thermal coffee maker as well. While it’s true that the paint tends to chip off and the Coffee Gator is prone to rust; those two minor flaws aren’t nearly enough to outweigh the benefits. This is easily the very best French press coffee maker of 2018.